Such garments as a Burberry olive trenchcoat and a black lace midi dress are the perfect way to introduce extra refinement into your day-to-day arsenal. When it comes to footwear, this look is finished off wonderfully with black leather pumps. As you can see here, looking stylish doesn't require that much effort. 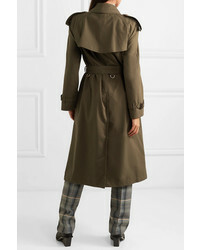 Just choose a Burberry The Westminster Long Cotton Gabardine Trench Coat from NET-A-PORTER.COM and white and black houndstooth dress pants and you'll look smart. When it comes to footwear, this outfit is round off wonderfully with black cutout leather ankle boots. If you're scouting for a casual yet absolutely chic ensemble, consider pairing a Burberry the westminster long cotton gabardine trench coat with charcoal jeans. Both items are totally comfy and will look fabulous together. To bring out the fun side of you, complement your getup with black leather flat sandals. 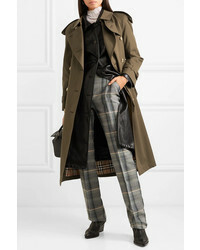 If you're in search of a casual yet incredibly stylish look, rock a Burberry The Westminster Long Cotton Gabardine Trench Coat from NET-A-PORTER.COM with a black jumpsuit. As well as very comfy, these two pieces look great when worn together. Amp up the cool of your look by wearing black suede pumps. 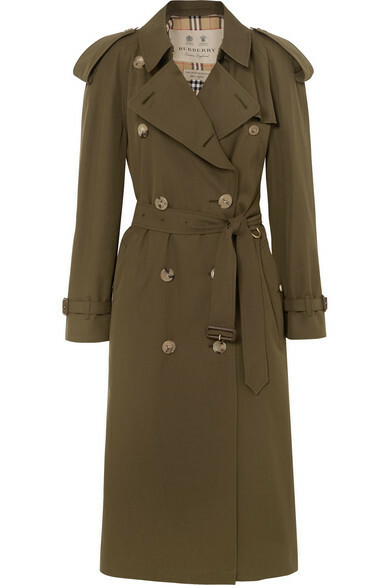 If you're on a mission for a casual yet chic outfit, wear a Burberry the westminster long cotton gabardine trench coat with a white midi dress. Both garments are totally comfy and will look fabulous together. When it comes to footwear, this outfit is round off wonderfully with white leather ankle boots. If it's comfort and ease that you're searching for in an outfit, wear a Burberry olive trenchcoat with black ripped skinny jeans. Sporting a pair of dark brown nubuck ankle boots is an easy way to add some flair to your outfit. If you're on the hunt for a casual yet totaly chic look, team an olive trenchcoat with blue ripped jeans. These two pieces are totally comfortable and look great paired together. Kick up the cool of your look by finishing off with black leather heeled sandals. 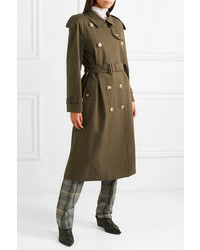 This combo of an olive trenchcoat and a dark green plaid shirtdress is an interesting balance between comfy and seriously stylish. When it comes to footwear, this getup pairs perfectly with black leather over the knee boots. 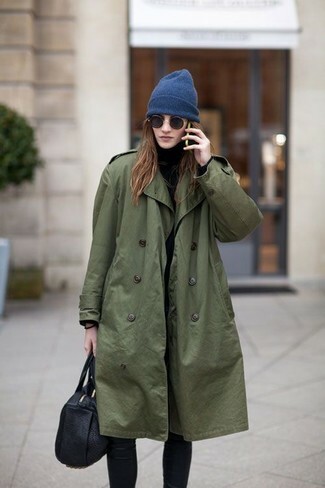 If you're on a mission for a casual yet incredibly stylish look, consider wearing an olive trenchcoat and black leggings. Both of these items are totally comfortable and will look great when worn together.